I LOVE coleslaw. Especially the sweet, creamy kind that you get at fast food restaurants. My husband, on the other hand, can’t stand mayonnaise. He won’t touch anything with mayo in it.. especially coleslaw. So in honor of National Salad Month and National Vinegar month (you didn’t even know there was such a thing did you? ), I tracked down a great substitute courtesy of Rachael Ray. The key to losing the mayo? Red Wine Vinegar! The finished salad is light and crisp and sweet. A great lower calorie substitute to the mayo-dressed fast food version. 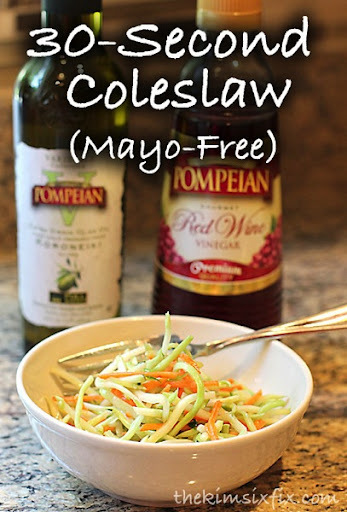 If you aren’t typically a coleslaw fan, this is definitely a good “gateway” recipe. Even my little guy enjoyed it.